Bureau of Transportation releases survey showing who rides electric scooters and why. At least 25 e-scooter injuries have been reported since Portland opened its streets — and sidewalks — to the upright electric vehicles more than 90 days ago. Staff at the Bureau of Transportation collected 17 reports of injuries from the police and fire bureaus as well as media accounts, plus four more related by eyewitnesses. 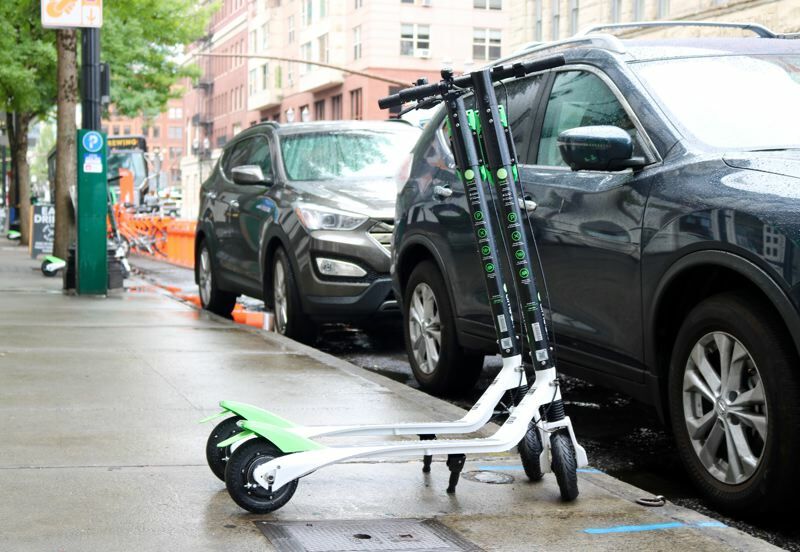 The three companies responsible for the electric scooters — Bird, Lime and Skip — submitted an additional four crash reports. Officials believe that number is only the tip of the iceberg. "We're certain that this is not the total universe of crashes or injuries in Portland," said PBOT spokesman John Brady. The most severe injuries involved broken legs, while the least severe were scratches caused by people tripping over e-scooters. In the future, the agency wants to coordinate with state and county public health authorities to cull injury data from local hospitals and urgent care centers. "A broken leg is significant," Brady noted. For context, the state Department of Transportation reports that 391 people have died this year on Oregon's roads as of Oct. 25, including 29 traffic-related deaths in Portland. There's still about a month to go until PBOT's electric scooter trial period ends, but officials have already released a snapshot of scooter data based on 4,500 responses to surveys sent to 75,000 riders. • 45 percent of local residents "never" use a helmet, while just 17 percent "always" wear one. About 59 percent of tourists also don't wear headgear. • 49 percent of tourists said they "sometimes" ride an e-scooter on the sidewalk, compared with 39 percent of locals. • 78 percent of Portlanders know helmets are required by law, and about as many know they are forbidden from piloting e-scooters on the sidewalk. About 65 to 67 percent of tourists know these rules. • 41 percent of local respondents said they used e-scooters less than once a week, while 26 percent said they use e-scooters one to three times a week. • 61 percent of residents "never" use an e-scooter to access other forms of public transit such as a bus or MAX line. • 37 percent of Portlanders would have walked to their destination had an e-scooter not been available. An additional 19 percent would have driven or hailed a car. • 6 percent of locals claim to have reduced the number of cars owned by their family because of e-scooters, and another 16 percent are considering it. • 69 percent of out-of-town visitors are "extremely likely" to recommend riding an e-scooter to a friend. • 62 percent of local riders are men. • 42 percent of e-scooter riders who were visiting Portland reported income above $75,000 annually. Some 472,069 trips on e-scooters had been recorded by Oct. 11. The average trip length was 1.2 miles. The Bureau of Transportation trial period for e-scooters ends on Nov. 20. "This is one of multiple ways we're going to be evaluating the scooters," said Brady. "This is the first step."